VAC is an efficient automatic tool for the analysis of Administrative Role Based Access Control (ARBAC) policies. Given an ARBAC policy, a user u and a role target, VAC checks whether u can obtain role target in any reachable configuration of the system (role-reachability problem). Several security requirements‑including escalation of privileges and conflict-of-interest properties‑can be automatically reduced to the role-reachability problem. Therefore, VAC enables policy designers and system administrators to check whether their policies meet the security requirements. VAC first uses an aggressive pruning aiming at reducing roles, administrative roles, rules, and users while preserving the reachability of role target. C programs which are analyzed by the C bounded model-checker CBMC (under-approximate analysis, useful to find security breaches). If a breach is found VAC produces a counter-example of the original policy showing how user u can indeed acquire the given target role. Horn programs. VAC supports the following fixed point engines for the analysis: Eldarica, HSF, and µZ. This approach leads to complete analysis. Boolean programs. VAC supports three model checkers for Boolean programs Getafix, Moped, and NuSMV. This approach also provides complete analysis. 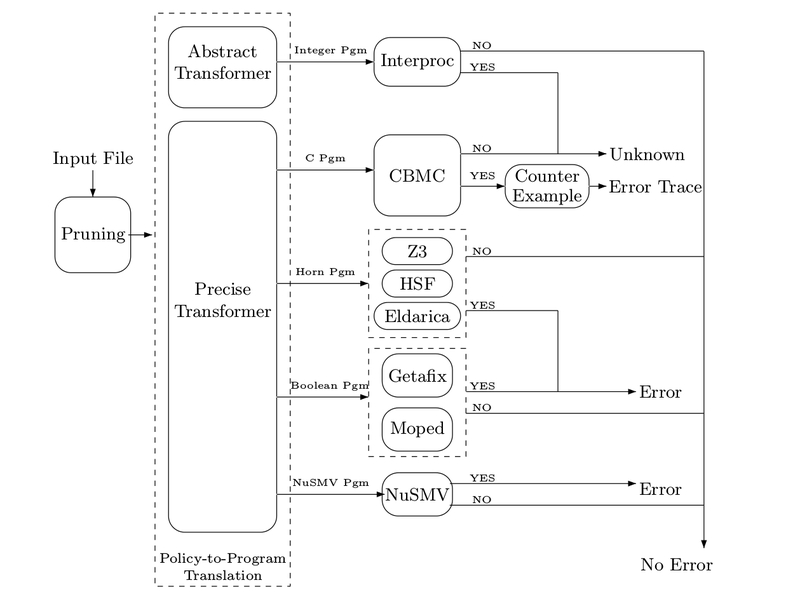 Abstract transformer: VAC converts ARBAC policies to imperative programs that simulate the policy abstractly, and then utilizes further abstract-interpretation techniques from program analysis to analyze the resulting programs in order to prove the policies secure. VAC uses Interproc for the analysis with box domain. If no error is found it is guaranteed that the target role is not reachable in the original policy as well. Otherwise, it is UNKNOWN whether it is also reachable in the original policy. This approach is in general more efficient for proving correctness than the precise approach. VAC allows to select the backend for the analysis by setting the appropriate options. By default, VAC uses first the abstract approach looking for the absence of a breach. In the negative case, it uses bounded model checking (CBMC with unwind set to 2) on the precise translation seeking for errors. If an error is found a counter-example is provided. Otherwise, VAC runs µZ for complete analysis. Security Analysis of Access Control through Program Verification by Anna Lisa Ferrara, P. Madhusudan, and Gennaro Parlato. 25th IEEE Computer Security Foundations Symposium (CSF). Cambridge MA, USA, 2012. Policy Analysis for Self-Administrated Role-based Access Control by Anna Lisa Ferrara, P. Madhusudan, and Gennaro Parlato. 19th Int'l Conference on Tools and Algorithms for the Construction and Analysis of Systems (TACAS). Rome, Italy, 2013. VAC - Verifier of Administrative Role-based Access Control Policies by Anna Lisa Ferrara, P. Madhusudan, Truc L. Nguyen, and Gennaro Parlato. 26th Int'l Conference on Computer Aided Verification (CAV). Vienna, Austria, 2014.
three sets of complex test suites capturing the complexity of realistic systems. All experiments were performed on a machine running Ubuntu 14.04 LTS 64 bit with an Intel i7-3770 CPU and 16 GB of Ram. The results of our experiments are reported in the tables below. Note: 'R' stands for Reachable, 'N' stands for Not reachable, 'U' stands for unknown (unknown whether it is reachable), 'E' stands for tool internal error, and '-' stands for timeout of 20 minutes.